← Is Southern Pride and Identity Consistent with Enlightened Thinking? When I joined an evangelical denomination in 1970, they read me the teachings of the church. I agreed to abide by prohibitions such as drinking alcohol or using tobacco, swearing oaths, wearing jewelry, and belonging to lodges. There were also many such prohibitions not on the official list, but they were VERY serious about all these ‘sins’. When a person begins to follow Jesus, their natural inclination is to want to live as he wants us to, but there are two ways believers go about doing this. The first is to discover the religious rules God wants us to follow, as my church did. The measure of success is how effectively we avoid ‘sins’. This is called legalism, on which I have written a number of posts. A second approach is to discover Jesus’ principles which give direction but not rules. These principles become our guide, and the measure of our success is how well we effectively treat people with their best interest in mind. There are no ‘sins’ to avoid; it is all in how we relate to people. I firmly believe this option expresses Jesus’ desire of us, based on his words and actions in the Gospels. 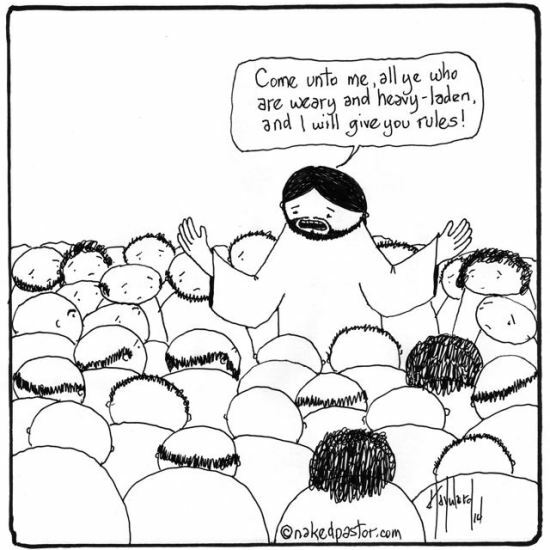 Following religious rules is actually the very opposite what Jesus teaches. Religious rules create a tremendous burden for the believer, while Jesus wishes to relieve our burdens; and they also prevent us from growing as healthy believers. 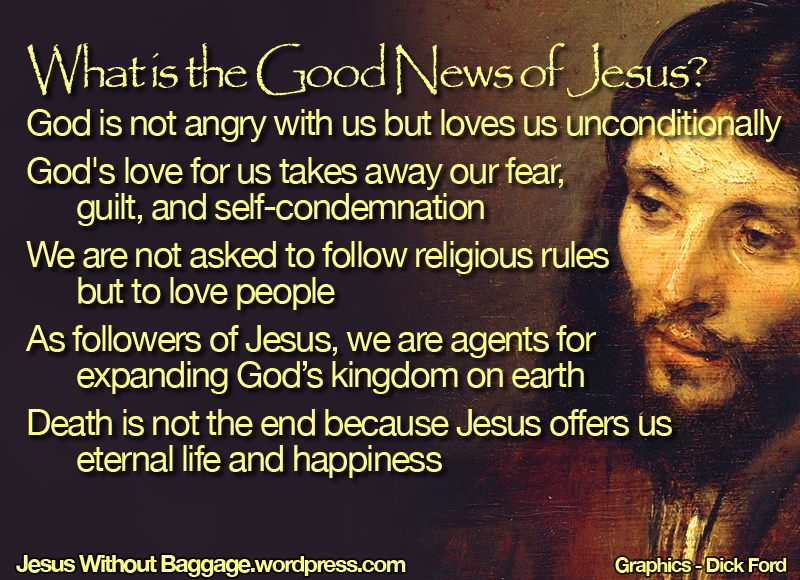 Knowing that we should live by Jesus’ principles and not by burdensome religious rules is Good News! On the other hand, legalism is Bad News. I don’t think those who teach and live by religious rules are bad; they sincerely think they are doing what Jesus asks. But they are misguided and heavily burdened down. Jesus wishes them better than that. What does it Mean to Love People? This is all well and good, but how do we even begin loving people if there are no ‘rules’ on how to do it? It helps to consider how we would like people to treat us. How are some ways you prefer to be treated? Why don’t you write them down? I think an important aspect is that our love and concern be genuine—not just a forced, legalistic duty we must perform. We can start by considering how much the Father loves us and is concerned with our good. As we get a glimpse of his love for us, we begin to feel more lovable and think better about ourselves in response. We can then consider how the Father loves everyone else in the same way, and as we come to see people as the Father sees them we can begin to love them as he does. Why don’t you think for a moment and add your own thoughts to this list? Then, if you wish, share your thoughts in comments below so we can all benefit from them. We will never be perfect in these behaviors, but we can commit to improve our interactions with others by remembering the Father’s love for us and for them. What Things Should We Avoid in Relating to People? These behaviors do not represent genuine love toward others. Why don’t you take a moment and jot down some other things that are inconsistent with genuinely loving people—then mention them in comments if you wish. If we have no genuine love for people, then we have no message for them either. If we do not love and care for people then all our judging them, telling them how sinful they are, and badgering them to accept Jesus will be ineffective. We might succeed in having them ‘pray the sinner’s prayer’, commit to our doctrinal beliefs, and follow us in taking up legalistic burdens, but their spiritual lives will be terribly flawed and stunted. We will never become perfect in loving people appropriately, but we can grow at it. Here are some steps that should help in that growth. First of all, read the words and stories of Jesus and notice how he consistently treats people—even those that many others thought not worth bothering about. The more you read about Jesus, the more you will understand how he demonstrated love and concern for others. Find people well along the way in loving people as Jesus taught. Talk with them about it and learn what helps them grow in love of others. These mentors might be authors of good books instead of someone you know, but in any case find people who evidence love and learn from them. Guidelines are not ‘rules’, and they do not replace good judgment in specific situations, but they can help prepare us for personal problem areas in interacting with people. An important one for me was ‘Don’t yell at people.’ Yelling at people is meant to be intimidating and dominating, and it leads to alienation rather than reconciliation. Often I was sorry once I cooled off, but the damage was done. Over time I was able to avoid yelling. Guidelines need not necessarily be written so long as we are prepared to use them as situations require. It is important to remember that guidelines are only for us; we cannot impose our guidelines on someone else, and no one can place them on us—that is legalism. I hope this post has been useful, and it leads into our next Good News topic: it is exciting Good News to learn that when we follow Jesus we become agents for expanding God’s kingdom on earth. And we have already taken an important step! Spreading love and reconciliation is an important part of the kingdom work. We will talk more about that next time. 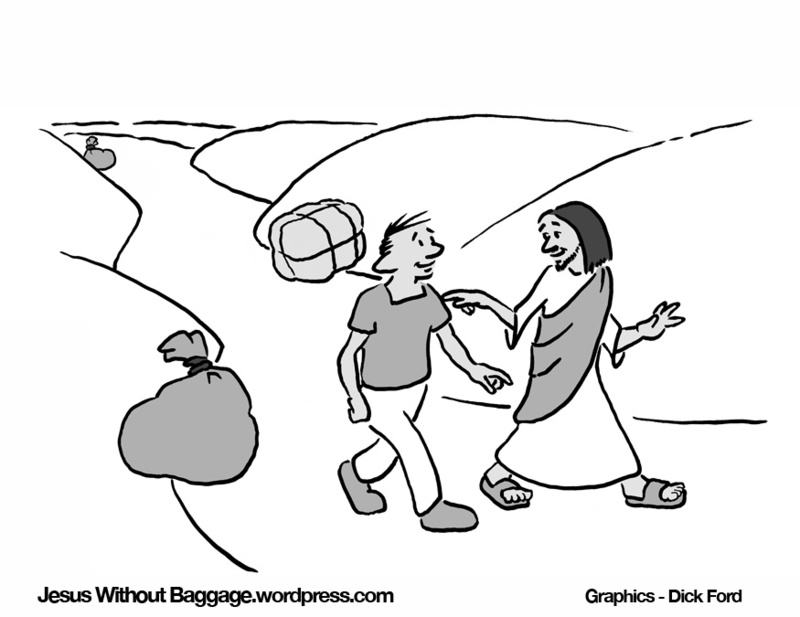 This entry was posted in baggage, behavior, Jesus, legalism, love, sin, The Father, the Good News and tagged Matthew 23. Bookmark the permalink. This is simply superb, Tim. Well put, sir! You did an excellent job of describing how a true Christian should feel and act towards people..it was very refreshing to hear. Hi Joann. I just recently learned that you are the younger sister of Brenda whom I knew in college. Welcome to the blog! Loving behaviors might include “forgiving”. This is often very hard to do, but trying to understand what led to the situation helps. And behaviors to avoid cold include (for me, anyway): not thinking of how your words might hurt or be experienced. Flippant, unthinking remarks may be funny to you, but hurtful to others. Excellent additions to a guideline list, Edie. I hope other people make similar suggestions. A very positive read. Since you asked for suggestions, I would add “Encouraging others to develop and use their unique talents” to the list of positive behaviours. Each of us has something to offer, but I meet too many people who don’t really seem to believe that their contribution is important. Thanks Tina, and thanks also for the suggestion–it is a very good one! Good message, Tim! Thank you. You are right. It’s not about more rules. It’s about a changed life where we love God, others, and ourselves. Reblogged this on Green Serendipity. We should be matured enough to follow God, and not follow what the Humans have created for their benefit, That is the reason that our parents advising that we should read Bible every day, and reflect on that day what you have read. I watched a short video of the actor, Will Smith talking about how life is to short to be spending time with people who are always putting us down. He said we should spend our time with people who always encourage us to do our best, believe we can, and support us in our efforts. Dennis, Good advice–and more good advice!